Procrastination is a funny thing: Dela ying a task usually lets the chore grow in my mind to unreal proportions, making it seem more annoying, boring or daunting than it would be if I just got it over with. Such was the case with the Transportation Security Administration’s PreCheck application. 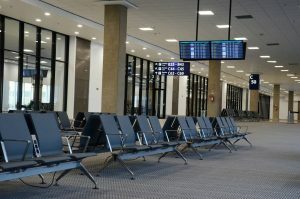 For several years I’d delayed signing up for PreCheck – which allows a more orderly trip through an airport security checkpoint – because I would need to visit the local office as part of the process. I couldn’t see how I could take two hours out of a busy workday to visit the office, a 20-minute drive in the wrong direction from my house. 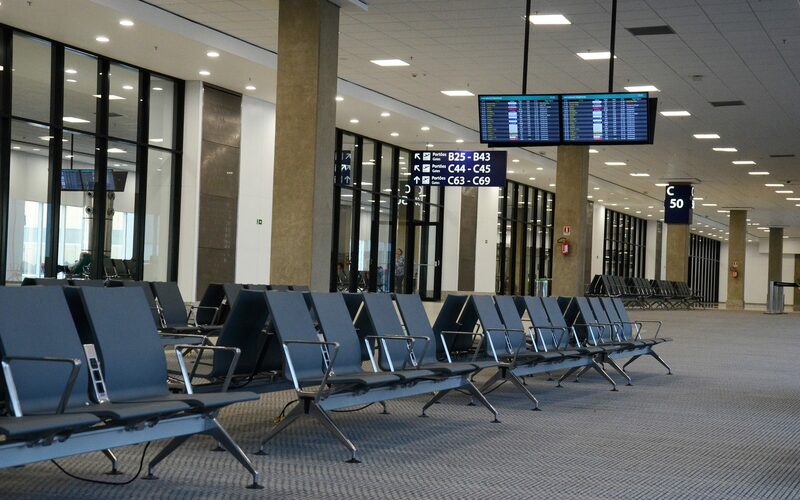 Without a PreCheck designation on a boarding passes, passengers must remove their toiletries from luggage; take off their shoes; take off their belt; remove their jacket; and pull their laptop from their suitcase. With PreCheck, travelers can sail through the screening fully clothed and with most electronics still stowed. I was not sold on the need for PreCheck when it began in 2013. Indeed, I mocked the idea of paying $85 for a background check that would grant a known traveler number to those deemed trustworthy. Removing my shoes and jacket wasn’t a big deal, I thought. But then airlines started occasionally assigning me to PreCheck free, and $85 suddenly seemed a bargain to regain some civility we’d lost since 9/11. Putting clothing, shoes, toiletries and laptops into bins for X-ray screening isn’t a problem. Travelers can undertake the process methodically, if quickly, in the lead-up to the machine. It was the rush on the other side that I dreaded. A slight panic would overtake me after I passed through the scanner. I’d be trying to gather my things from the conveyor, repack my belongings (Everything used to fit!) put on my shoes and get out of the way before the next suitcase came crashing down the conveyor and I was in everyone’s way. Invariably, I would – absentmindedly – stuff my boarding pass into a pocket or a purse or a bag so I’d have two hands to tie shoes and repack as fast as possible. I’d be searching frantically for the boarding pass five minutes later having no clue where I’d stored it. I am clearly not alone in this discombobulation. A huge number of items are left at TSA screening areas every year, from coats and watches to laptops and wallets. In 2015, TSA collected more than $750,000 in loose change alone. Last week, I went to John Glenn Columbus International Airport and met with TSA workers to finalize the application that I’d filled out online. I had imagined a Bureau of Motor Vehicles kind of queue, but applicants were given appointments, and I was in and out in less time than it had taken me to find a parking space. Five minutes was all that was needed for me to answer a few questions, let the workers take my fingerprints and pay my fee. My two-year wait seemed a bit silly after that quick dispatch. Earlier this week, I received email telling me I had been approved. I now have a known traveler number to use when I fly. I won’t always be able to go through security screenings easily; airports don’t always have a PreCheck lane active. I’ll need to renew in five years, but I will be less likely to delay. If you would like more information on applying for PreCheck, visit www.tsa.gov. Conclusion: Why did I wait? My winter hike in Hocking Hills was mostly a success, but it was somewhat lacking in a key ingredient: winter. The hike to the Rock House on Sunday was more like a spring outing, which was both good and bad. Good because we didn’t risk sliding to our deaths on the icy rock stairs. Bad because we didn’t get to see a frozen waterfall or icicles hanging from the rock face. Although the towering trees are still leafless, the hills had plenty of color. Velvety moss shone a vivid green and Christmas ferns poked through fallen leaves. Giant hemlocks graced the hillside, and a huge rhododendron near the rock bridge made me wish that central Ohio had more acidic soil. When I worked in West Virginia, one of my fellow reporters often referred, derisively, to my home state as “the flatlands.” True, much of Ohio was scoured flat by glaciers. 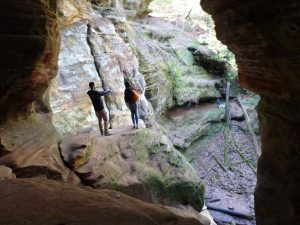 But he and the other Ohio mockers have never seen the stunning landscape features like that of Rock House, Cantwell Cliffs, Old Man’s Cave and the rest of Hocking Hills State Park. 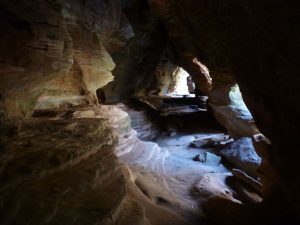 The Rock House is a true cave, carved through the eons from Blackhand sandstone. 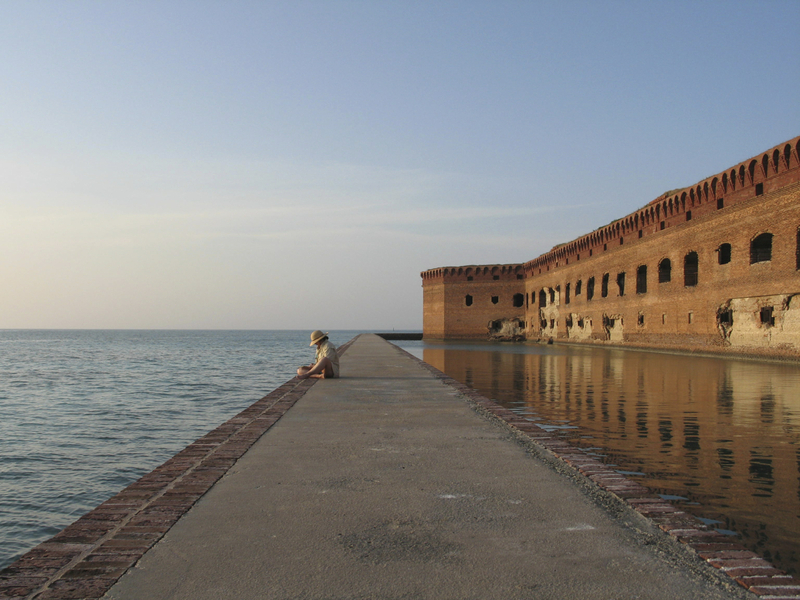 The result is a room 25 feet high and 200 feet long that has been used as a shelter by Native Americans, travelers, and, according to lore, the occasional thief hiding from the law. 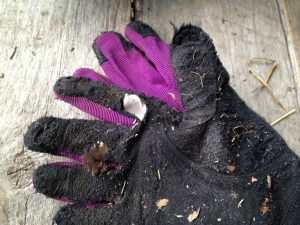 The weather was cold enough to require hats and gloves. A few tiny icicles clung to the cliff side, and the end of a log was encased in ice. But I shed my coat for just a fleece jacket not long into the hike. It was a peaceful walk, and once past the Rock House we had the trail almost to ourselves. The outing let me plan something I’d never undertaken before: a winter picnic. Figuring out what I could take that could warm us after the hike was a fun challenge. I wanted foods that would be relatively easy to make and that would travel well in thermoses. I opted for shredded beef, served on focaccia bread; carrot soup; and mulled cider. Friends supplied hummus, crackers, fruit and brownies. We were alone in the picnic area after our walk, enjoying the sunshine. 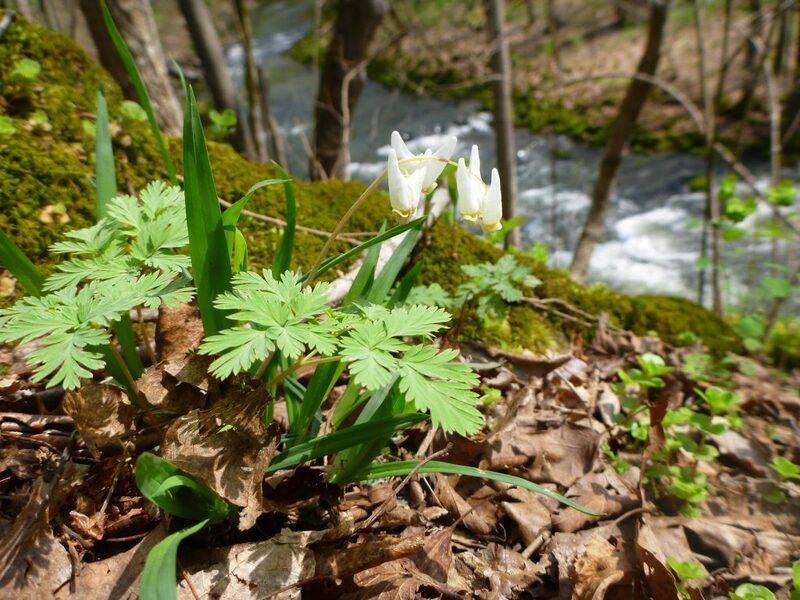 Ohio’s heat-generating wildflower is in bloom, signaling that spring isn’t that far off. 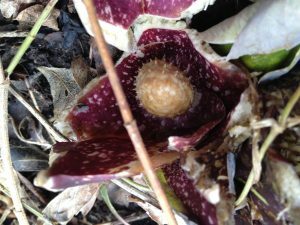 One of the first wildflowers to appear each year, skunk cabbage (Symplocarpus foetidus) has been showing its colors for several weeks in wet, marshy woodlands of central Ohio. Besides its early bloom time, one of the plant’s most unusual characteristics is its ability to defy frigid weather. 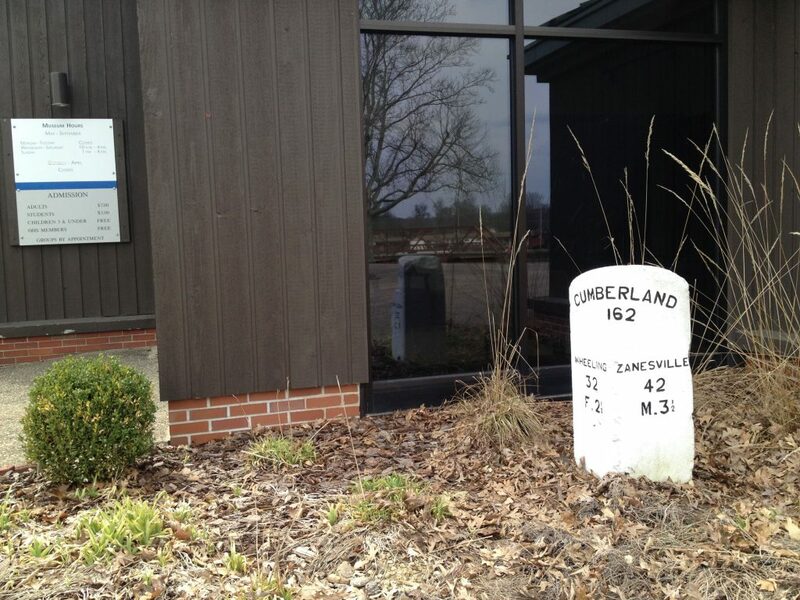 The National Wildlife Federation says its flower buds can warm up to 70 degrees to melt snow around the plant. Indeed photos often show the red-and-green mottled spathes surrounded by ice. The spathes rise from the mire only a few inches to curl protectively around a yellow spadix. The petal-less flowers of the spadix attract flies and beetles to spread their pollen. After the bloom fades, tropical-looking leaves appear, although they don’t last long in the wet areas where the plant thrives. Until this week, I’d seen only photos of this plant, a member of the arum family. Although I’ve wanted to see it, I’ve never had time to go exploring woodlands during the short days of February before. Skunk cabbage can be seen along both sides of the boardwalk at the small park, 6245 Riverside Drive, Dublin. It also can be seen a bit off trail, at the end of a well-worn path. But be sure to watch where you step if you go off-trail. Although not fully camouflaged, skunk cabbages blend into the winter landscape. The park makes for a nice walk, although it’s a testament to the evils of Asian honeysuckle and privet, both of which run rampant in the park. Still, I saw a number of interesting birds, including a bluebird, during my walk there. 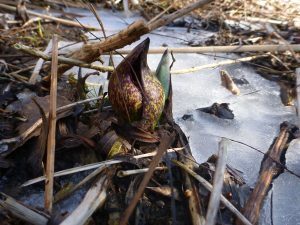 Besides skunk cabbage, a few other flowers are signaling the coming of spring. 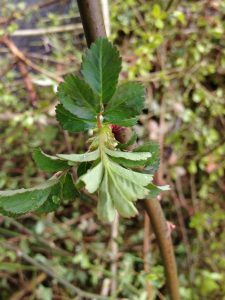 Witch hazel, a yellow-flowered shrub native to the state, has been sighted, as have exotic snowdrops and winter aconite. And now I’ll make a pitch to nature lovers everywhere: If you enjoy nature, you should follow Jim McCormac’s blog, jimmccormac.blogspot.com. Jim always points out interesting finds, accompanied by tremendous photos. Conclusion: A walk in the woods is never wasted. Guns really do smoke when you fire them. I’d never given much thought to the origin of the word gunsmoke till I saw the gray curl wafting from the barrel of a handgun I’d just fired. My eagerness to learn to shoot probably surprises some friends. I seem more inclined to toy with yoga poses and garden shears than bullets and gunpowder. But I grew up around guns. My father hunted when I was young, although he quit when the scopes became so powerful that he felt the deer didn’t have a sporting chance. I wasn’t drawn to shooting to protect myself or home; I have little doubt that I would be the cautionary tale of keeping a gun in the house. I would have it wrested away from me by an intruder or shoot myself in the foot while cleaning it. I wanted to try the activity for the sport, for the precision required. 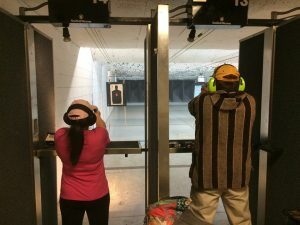 Former co-worker Glenn Sheller recently took me to his indoor shooting range in Lancaster for my first lesson. Although I’ve been around guns all my life – and even inherited one of my father’s rifles, I’d never fired one. Glenn set me up with a Ruger .22 pistol, which was light enough for me to hold steady. That crafted bit of black metal was intimidating, with so much power is packed into such a small device. But I respected the gun the way I respect large bodies of water. 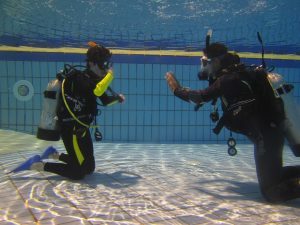 Around water, you must always be aware that it can kill. Glenn showed me the basics: safety measures, proper grip, ideal stance. And then I began shooting. Using the .22, I hit the center of the target with a respectable number of shots from the Ruger over the next 90 minutes. Glenn let me try a .22 Magnum revolver as well. It was heavier, with a trigger that required more force. But with the revolver and later with a 9 mm, my aim was wilder, not nearly as accurate. 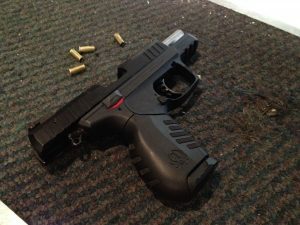 I went back to the Ruger, with which I’d grown relatively comfortable with in a short time. Keeping all Glenn’s guidance in mind as I shot was a bit of work. If I got my grip right, I let my stance slide. If I got my stance right, I anticipated the recoil. I tended to shoot always a bit to the left of where I aimed. When we left, I could taste the sulfur of the gunsmoke at the back of my throat. Glenn was an excellent teacher, though, and I enjoyed my time at the shooting range. Conclusion: I’ll do this again.